After terror attacks left at least seven people dead and dozens injured in London, right-wing media called for the internment of Muslims, replicating the unconstitutional measures that imprisoned thousands of innocent Japanese-Americans during World War II. Savage, a bigoted conspiracy theorist, has a close relationship with Trump, frequents his Mar-a-Lago Florida property, and once claimed that he was "the architect of Trump’s messaging." Savage, who has previously called for “kill[ing] 100 million” Muslims, was one of the first right-wing media figures to openly and repeatedly question former President Obama's birthplace and religion and has a history of promoting bizarre conspiracy theories about murder and diseases. MICHAEL SAVAGE (HOST): Should the government regulate Twitter, Facebook, and the other sites that are being used to communicate by the rats in dirty headscarves who are killing our children? What would you do to stop this? Should Islam immediately be banned from prisons? Well, you can't ban Islam. Isn't it just like Christianity, and Judaism, and Buddhism? No, no it is not. Ariana Grande gave another concert in Manchester and raised money for -- I don't know what the money was for. Is that a way to fight Islamism? Having another concert? Is that the answer? Of course that's not the answer. Now, I said the same thing last week. Why are we going soft on Islamists when they're going hard on the West? I'm asking you a question. How much longer are we going to tolerate them killing us and killing our children? The answer is, a very long time, because America is a weak nation, it has been poisoned by many, many different sources. SAVAGE: Yes, it’s true I had a big hand in helping Donald Trump and get his message across and, therefore, getting him elected. There’s no question about that. I’m sticking to the subject matter of today: What needs to be done to stop Islamists who are on the watchlist in America right now. We were told there were over 1,000 active cases, that was a few months ago when the FBI was run by what’s his name again, I forgot. The guy who is no longer there, I forgot his name already, Mr. Comey, Mr. Comey. He said he had 1,000 active cases, or DHS did. What does that mean, 1,000 of them are on the list, or there’s more than 1,000? Why don’t you intern all of them before they run people over on a bridge, or stab people in the street? It was done during World War II. How do we know that the internment in World War II didn’t help us win the war? Vice President Mike Pence and Environmental Protection Agency head Scott Pruitt are appearing on Michael Savage’s radio program in the wake of criticism surrounding the administration’s decision to withdraw from the Paris climate agreement. Savage is a climate change denier who has used his radio program to attack people with autism, posttraumatic stress disorder (PTSD), and depression, and has advocated for killing “100 million” Muslims. Savage has no credibility to talk about anything of substance, as Media Matters has documented. He’s called autism "a fraud” and “a racket"; said people with PTSD and depression are "losers"; advised people not to get flu shots because you can't trust the government; theorized that liberals have been driven insane because of seltzer bubbles; and claimed that the “asthma epidemic amongst minority children” is actually "a money racket" because “the children got extra welfare if they were disabled.” Like President Trump, Savage believes that manmade climate change is a “scam” and a hoax. Savage also claimed that Obama “wants to infect the nation with Ebola” and the then-president was gearing up the government to “fight a war against white people.” Savage accused Obama of engaging in “genocide” against the white race during the last year of Obama’s presidency. According to news sources, President Donald Trump invited alleged human rights abuser President Rodrigo Duterte of the Philippines to visit the United States during an April 29 phone conversation. Just days before, Trump ally and radio host Michael Savage promoted Duterte on his radio show and has previously applauded the Philippine leader for “killing drug dealers” and arguing that “a lot of people wouldn’t be too unhappy with that” in the United States. Trump and Savage have a long and close relationship including Savage frequently hosting Trump on his radio show and the pair partying together at Trump's Florida property, Mar-a-Lago. 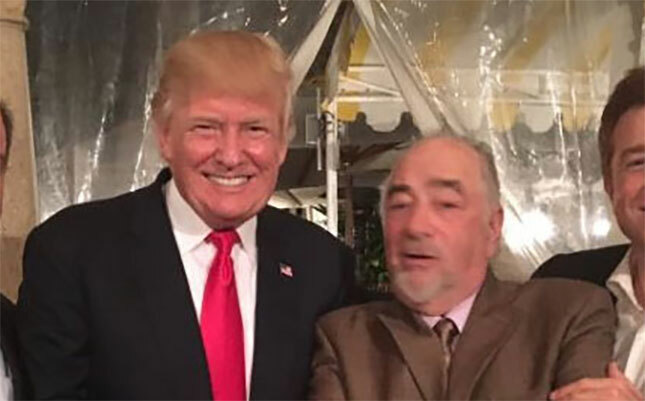 Trump Ally Michael Savage Wants Rep. Maxine Waters Charged With "Sedition"
Radio host Michael Savage claims he recently sat with President Donald Trump for “over an hour” and advised the president to continue falsely claiming that climate change “has nothing to do with mankind.” According to Savage, the president credited him with helping swing the election and encouraged him to keep broadcasting for “another 25 years.” Savage has used his radio program to attack people with autism, PTSD, and depression, and has advocated for killing “100 million” Muslims. MICHAEL SAVAGE: I said, "Let me tell you the story about global warming, President Trump, it’s real simple. There have been at least five ice ages on this earth that we know of in recorded history. Five ice ages came and went long before there was industrialization. It has nothing to do with mankind." Big smile. Big smile. It’s simple. It’s simple. I don’t need mathematical formulae. If you went to the fifth grade you could understand that. While the ice ages Savage referenced -- as well as historical warm periods -- did occur due to natural causes, Skeptical Science and others have debunked the ice ages argument and explained that today’s climate change can be explained only by human activity. An overwhelming majority of climate scientists have concluded that human activities are the primary cause of climate change. Savage has no credibility to talk about science. He’s called autism "a fraud, a racket," said people with PTSD and depression are "losers," advised people not to get flu shots because you can't trust the government, and theorized that liberals have been driven insane because of seltzer bubbles. Trump Attends Closed Event With Michael Savage And Newsmax CEO Who Criticized Reince Priebus For "Weakness"
President Donald Trump spent time over the Presidents’ Day weekend in the company of right-wing media figures who have a history of pushing anti-Muslim bigotry and conspiracy theories. Savage, a conspiracy theorist with an extensive history of bigotry, was an early backer of Trump’s campaign and said last February that he was “the architect of Trump’s messaging.” In 2006, Savage called for “kill[ing] 100 million” Muslims. Following the terrorist attacks in Brussels, Belgium, in March 2016, Savage asked Trump to consider “closing the radical mosques in America.” In December, Savage mocked Muslim-Americans worried about Trump’s election, suggested Muslim immigrants came here “to stab people in the street, jump the curb with a car and run them over,” and argued that if you “interpret” the Quran “literally, you'll wind up cutting everyone's throat, blowing things up, and killing children.” Savage was also a birther, like Trump, who said Obama’s birth certificate was not valid, and claimed that Obama was gearing up to “fight a war against white people” and that Obama was engaging in “genocide” against white people. He has demanded a “revolution” in response to multiculturalism. In 2008, Savage claimed that autism was “a fraud” because “in 99 percent of the cases, it's a brat who hasn't been told to cut the act out.” Savage also has claimed that former President Barack Obama wanted “to infect the nation with Ebola,” attacked those with PTSD as “weak” and “narcissistic” “losers,” claimed lesbians are “jealous that they don't have an AIDS epidemic that they can cash in on,” and suggested that seltzer water and its “little bubbles of carbon dioxide” have driven liberals to “insanity.” More recently, Savage said in December that homeless people were “bums” and that the word “homeless” was “a construct of the radical left.” Trump has said that America would get “common sense” if Savage headed the National Institutes of Health (NIH). Ruddy, a longtime personal friend of Trump’s and the CEO of Newsmax, said in 2011 that Media Matters was “right” that Newsmax was an “early and enthusiastic promoter of Trump's presidential ambitions.” The website also repeatedly pushed the false claim that Obama’s birth certificate was not real. Ruddy himself said in 2009 that while there was “no evidence" Obama wasn't born in the United States, "there's some legitimate issues involving the birth certificate." Earlier this month, Ruddy criticized Trump’s chief of staff, Reince Priebus, saying there’s “a lot of weakness coming out of the chief of staff."